The Teenage Mutant Ninja Turtles have made a wrong turn and found themselves cornered in an alley by the Purple Dragon gang. The Dragons make fun of the freaks in the turtle costumes, but of course, those aren’t costumes. The Turtles spring into action and jovially take out the weapon-toting thugs one at a time. As the final thug flees in terror, Leonardo orders his brothers to disappear before the police arrive. 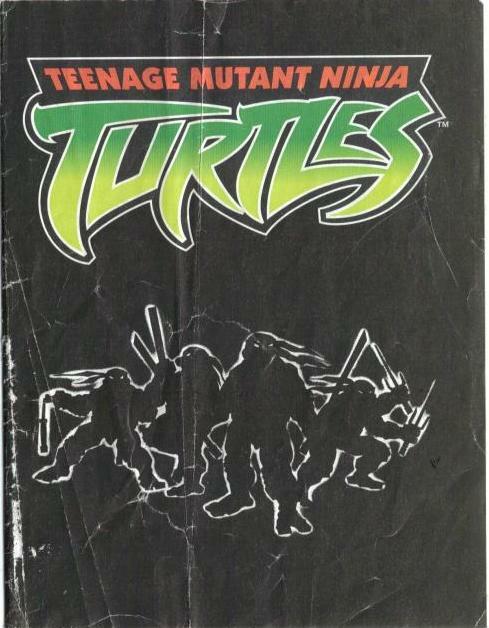 *This 8-page pack-in minicomic was distributed at Toys ‘r’ Us locations in late 2002 as part of a “Fox Box” package; a box containing promotional materials for the then-new Fox Box Saturday Morning programming block (of which the 4Kids TMNT cartoon premiered on). *This story is essentially a retelling of the opening scenes of the first episode of the 4Kids cartoon, “Things Change”… which also makes it essentially a retelling of the opening scenes from TMNT (Vol. 1) #1. 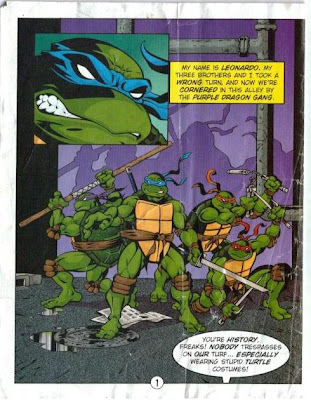 Special thanks to the guys at The Technodrome Forums for hooking me up with scans of this comic! As you can tell, despite the massive amount of the things printed and their tremendous availability… not a whole lot of them have survived the past nine years in very good condition. Such is the fate of most promotional material handed out to 6 year-olds, alas. While one look at that story summary will leave you thinking that this is a pretty boring little footnote in Turtle pack-in comic history, it does have one inherent value in that it’s basically the first few pages of the TMNT (Vol. 1) #1 redrawn by Michael Dooney. And for anyone who is a Michael Dooney fan, that’s kind of cool. 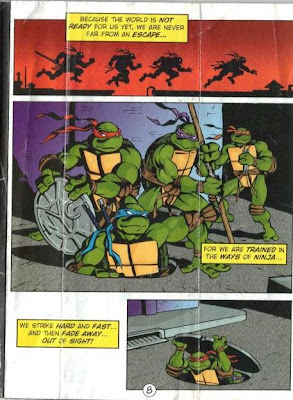 Though while he recreates several of the classic pages (the Turtles cornered in the alley, the two-page spread of them leaping into action, etc. ), he pads most of it out with goofy “comedy fighting” and a lot of stupid oneliners. “It’s Turtle Thrashin’ Time!” “Shell-Onimo!” “Eat wood, scum!” That last one might make you snicker when taken out of context. A lot of lines from the original Mirage comic are ported over to this thing, even moreso than what was reused for the 4Kids episode “Things Change”, which this is ostensibly a remake of. They get a bit… manhandled in the transitioning process, particularly that last one about fading away “…out of sight”. Not that it’s a big deal if a promotional cartoon pack-in comic changes a few lines of dialogue from its source material, though I’m just curious what was wrong with “…into the night”? Anyway, like most pack-in comics, this thing is “neat” and that’s about it. The lack of having an original story might put it low on the priority list of the five people on the planet who collect these things, but the Michael Dooney art should give it a nudge up the ladder for you. I'm kinda curious about the 2 page "We're not wearing costumes" bit. Would be cool if you could leave us links to the forums with the scans. There are plenty of other goodies in there too, if the links aren't broken.